I’m fairly sure a robot wrote this but it might be worth adding to your mosaic nonetheless. At Q3’s end, a total of 11 of the hedge funds tracked by Insider Monkey held long positions in this stock, a change of 10% from the previous quarter. 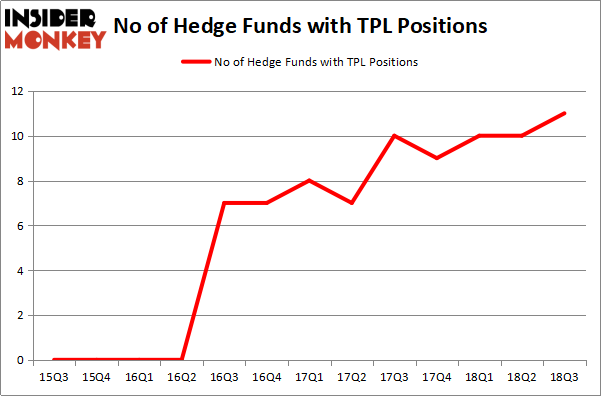 On the other hand, there were a total of 9 hedge funds with a bullish position in TPL at the beginning of this year. With hedgies’ capital changing hands, there exists a select group of noteworthy hedge fund managers who were upping their holdings meaningfully (or already accumulated large positions). The largest stake in Texas Pacific Land Trust (NYSE:TPL) was held by Horizon Asset Management, which reported holding $1578 million worth of stock at the end of September. It was followed by Polar Capital with a $24.7 million position. Other investors bullish on the company included Arrowstreet Capital, White Elm Capital, and Renaissance Technologies. Consequently, key hedge funds have been driving this bullishness. Polar Capital, managed by Brian Ashford-Russell and Tim Woolley, created the most outsized position in Texas Pacific Land Trust (NYSE:TPL). Polar Capital had $24.7 million invested in the company at the end of the quarter. It’s hard not to marvel at growth in royalty barrels of oil (and the MCF of gas) that TPL has seen since 2008. Royalty oil barrels have seen a 26.4% CAGR over the past 9 years while GAS MCF has grown 28.6% on an annualized basis. As impressive as that is, growth recently has been going parabolic as detailed in the 2017 annual report. Oil and gas royalty revenue was $61.3 million for the year ended December 31, 2017 compared to $30.0 million for the year ended December 31, 2016, up 104.4%. Oil royalty revenue was $38.8 million, up 76.3% and gas royalty revenue was $14.8 million, up 85.3%. Additionally, oil and gas royalty revenue for the year ended December 31, 2017 included $7.7 million related to an arbitration settlement with Chevron U.S.A., Inc.
Crude oil production increased 43.8% in 2017 compared to 2016. The average price received in 2017 was $47.33 per barrel, compared to $38.60 in 2016. Gas production increased 59.8% in 2017. The average price of gas received increased to $3.56 per MCF in 2017 from $3.07 in 2016. State oil and gas production taxes were $2.9 million in 2017 compared to $1.6 million in 2016. Of course this can’t last forever but it is reasonable to expect continued growth for some intermediate period. Along with that growth will come top line growth if oil prices continue to play ball. As detailed in the 2Q 10Q, 2018 will obviously be another leap. Oil and gas royalties. Oil and gas royalty revenue was $30.3 million for the three months ended June 30, 2018 compared to $12.2 million for the three months ended June 30, 2017. Oil royalty revenue was $24.7 million for the three months ended June 30, 2018 compared to $8.8 million for the comparable period of 2017. This increase in oil royalty revenue is principally due to the combined effect of a 117.0% increase in crude oil production subject to the Trust’s royalty interest, and a 29.4% increase in the average price per royalty barrel of crude oil during the three months ended June 30, 2018 compared to the same period in 2017. Gas royalty revenue was $5.6 million for the three months ended June 30, 2018, an increase of 63.0% over the three months ended June 30, 2017 when gas royalty revenue was $3.4 million. This increase in gas royalty revenue resulted from a volume increase of 138.0% for the three months ended June 30, 2018 as compared to the same period of 2017, partially offset by a 31.7% decrease in the average price received. Yes, you read that right. 117% increase in oil production. Where could we go from here? Thinking about revenue, if we assume 2Q production growth to be equal that for all of 2017, we could get to a total annual royalty barrel number of 1,776,913. At a price of $61.20 (29% above last year), ballpark oil top line comes out at $109MM. 10% growth sequentially on that for the next 4 years gets us to $120MM (2019), $132MM (2020), $144MM (2021), and $159MM (2022). When 2018 estimates are included, that is $664MM cumulatively. Or about 11% of market cap. That’s just oil. And at 10% growth. And for 5 years. Tack on another ~30% to that number for gas and you get to $863MM. That gets you to 14% of market cap. This is all before the taxman takes his (now reduced!) bite. Nevertheless, the outlook for buybacks appears bright. Author’s note: I probably screwed this up. Let me know where I went wrong. Also, let me know if you think my assumptions are terrible. Special thanks to JackFutures from SeekingAlpha for sharing his many data series! Both the WSJ and Bloomberg have run articles this year about the power (or lack thereof) of earnings blackouts. Both suggest that stock prices can get weak when companies are prevented from purchasing their own stock due to prudence around the possibility (or perception) of trading on insider information. An astute TPL investor would conclude that buyback blackouts are a big deal for TPL since, well, buybacks are its core competency. I’m not a statistician, nor do I play one on TV but it does appear to me as if the lack of buybacks is a material driver in month to month price action. Below is the simple average monthly return of all monthly periods since July 1980. YTD October 2018 at -8.99% is included as a full month in this analysis. Note that “blackout” months (my assumption) are highlighted in red and represent 2 of the 4 lowest monthly average returns and 4 of the 6 lowest average monthly returns. If you consider December a throwaway month (tax planning), the blackout effect gets even stronger. On the flipside, you really want to own TPL in Feb, May, Aug, and Nov which are the months TPL reports prior quarter earnings. Reporting is typically very early in the month. I assume TPL comes out guns blazing after that to do its buying. Consulting firm Arthur D. Little has released a report (trying to get my hands on it!) that forecasts some big growth in extracted BOE, wells, and related CAPEX. The Permian, which is the top oil producing field in the United States, is producing more than 3.4 million barrels of oil a day. Growth of 3 million barrels a day by 2023 would put it near 6.5 million barrels a day, a production level above Canada, Iran and Iraq. Implications for TPL are many. We have to assume some of the projected new wells will be either on mineral interest land or sundry income producing surface land. It is also reasonable to project that growth in water needs will move linearly should AD Little’s forecast come to pass. Lastly, easements for pipelines, roads, and other infrastructure would be expected to grow in number and in total contribution to top line under the scenario detailed above. I’m seeing chatter about $30yr/EPS as being a reasonable possibility after you annualize the expectations for Q3. $30 EPS puts the trailing multiple at 29X with the stock at $864 as I type. If a doubling in production is not unreasonable (per above) then we’re looking at a 14.5X multiple on future earnings for a company with significant hidden assets. The UT Bureau of Economic Geology led the study that highlights key differences in water use between conventional drill sites and sites that use hydraulic fracturing, which is rapidly expanding in the Permian. The study was published in Environmental Science & Technology on Sept. 6, with results indicating that recycling water produced during operations at other hydraulic fracturing sites could help reduce potential problems associated with the technology. These include the need for large upfront water use and potentially induced seismicity or earthquakes, triggered by injecting the water produced during operations back into the ground. For conventional operations, the produced water is disposed of by injecting it into depleted conventional reservoirs, a process that maintains pressure in the reservoir and can help bring up additional oil through enhanced oil recovery. Unconventional wells generate only about a tenth of the water produced by conventional wells, but this “produced water” cannot be injected into the shales because of the low permeability of the shales. The study found that the produced water from unconventional wells is largely injected into non-oil-producing geologic formations—a practice that can increase pressure and could potentially result in induced seismicity or earthquakes. The study points out that instead of injecting the produced water into these formations, operators could potentially reuse the water from unconventional wells to hydraulically fracture the next set of wells. Enough water is produced in the Midland and Delaware basins in the Permian to support hydraulic fracturing water use, and the water needs only minimal treatment (clean brine) to make it suitable for reuse. Who’s got enough land to store and re-distribute vast quantities of water throughout the basin? Below is a link to the study. More to come from me after I dig in.